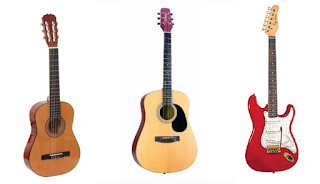 Guitar Blog: Which guitar should I learn on? This is a common question. You can in fact start on any guitar as long as it has 6 strings and is in reasonable condition. Below I have listed some pluses and minuses of each of the three most common types of guitars. +Nylon strings so tends to be easier on the fingers. +Perfect for amping up, adding effects or even plugging into your computer. -You need some kind of amplification. As you can see each choice offers something different but if you are like me you will end up with one (or more) of each. Size is also a consideration depending on your age. For help please contact Ian at Artist Guitar and remember to mention that you came via G4 GUITAR to receive a free gift with every purchase.